Figure 1: Zannoni Map of the British Isles, 1771. 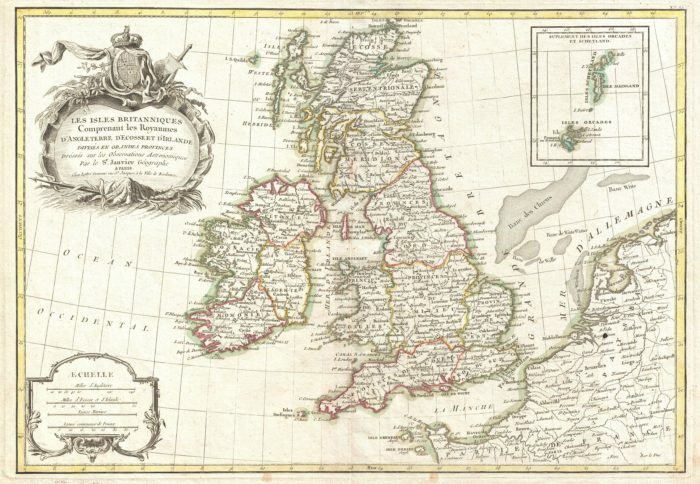 Scotland and Ireland were both far away from London as far as eighteenth century travellers were concerned. For the Irish, getting to London involved a dangerous sea journey across the Irish sea. For the Scottish, either a sea passage along the coast, or a long and uncomfortable overland journey. One of the elements that’s been cropping up in our ongoing study of vagrancy, is that vagrants from Ireland and those from Scotland appear to have been drawn from completely different demographic groups from one another. In other words, an Irish vagrant in London was not like a Scottish vagrant at all. It seems that the only thing they may have had in common was the fact that they were both probably poor and being expelled back home. Figure 2: Demographics of Irish Vagrants Expelled from Middlesex by Month of Expulsion 1777-1786. 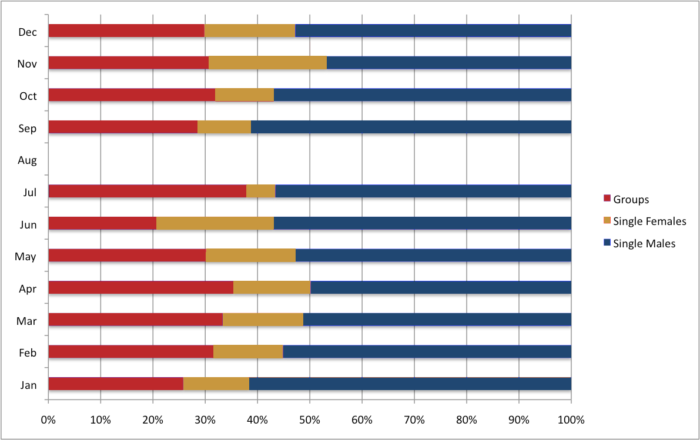 As you can see in Figure 2, the Irish are overwhelmingly men expelled on their own (blue bars), as opposed to women travelling alone (gold) or family groups (red – meaning an adult and at least one dependent, either a wife or child(ren)). This solo-male predominance persists no matter what month the vagrant was expelled. August is empty because our records were part of a series of records that were compiled 8 times per year, and that never took place in August (even eighteenth century administrators needed a holiday). As you can see, Irish women were incredibly rare amongst vagrants removed. This makes the Irish unique, because as we argued in ‘Loose, idle and disorderly: vagrant removal in late eighteenth-century Middlesex’, Vagrancy in London overwhelmingly picked up women. In other words: the vagrancy system in London was a system for expelling unwanted vulnerable women who might become a financial burden on the local parish’s poor relief system. But not so for Irish vagrants. It was instead a system for removing unwanted men. Figure 3: Demographics of Scottish Vagrants Expelled from Middlesex by Month of Expulsion 1777-1786. 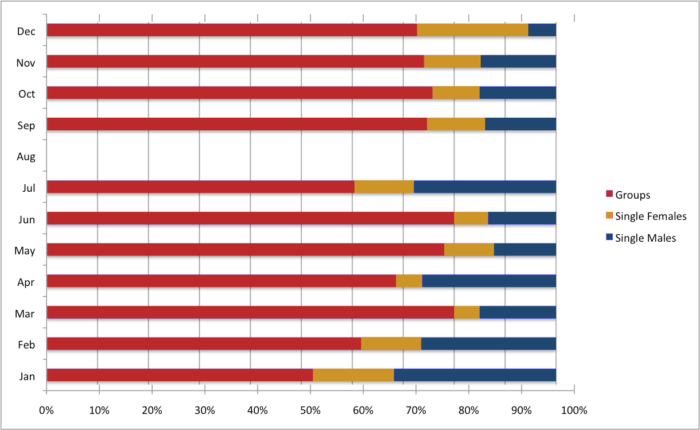 The Scottish on the other hand show a completely different demographic pattern, as seen in Figure 3. Scottish men traveling on their own were rare. That’s particularly so in December, as well as March, May, and June. Even at their peak they never made up more than one third of Scottish vagrants. Scottish women were also relatively unusual amongst those expelled from Middlesex. So again, the Scottish vagrant (like the Irish) is unlike the English. But overwhelmingly the Scottish story is one of families being sent back north across the border. These observations that we see from Figures 2 & 3 raise all sorts of questions. Firstly, we of course need to ask why we see these differences. In the case of the Irish, the answer is significantly related to demobilisation of soldiers and sailors after the American War of Independence. This in its own right is interesting, because we’ve repeatedly been told that Irish Catholics were not permitted in the armed forces until 1793 – though Terence Denman’s oft-overlooked claims have long-refuted that oversight. Secondly, the nature of the Scottish border in particular is striking. We might imagine that it was an imaginary line between two countries that had been in a union for more than seven decades by the time of our period. But this result suggests a much more tangible border that reflects a different culture. Why are so many Scottish families being expelled, when the English from the north don’t follow the same pattern? Finally, this tells me that we need to look closer at the ways the different parts of the British isles were connected, and the ways that they were not. There is not one story of vagrancy and migration within Britain and Ireland, and these data highlight that. Jean Janvier, ‘Les Isles Britanniques Comprenant les Royaumes D’Angleterre, D’Ecosse et D’Irlande divisee en grands provinces‘ (1771), [Digital Image: Wikimedia Commons]. Tim Hitchcock, Adam Crymble, and Louise Falcini, ‘Loose, Idle and Disorderly: Vagrant Removal in Late Eighteenth Century Middlesex’, Social History, vol. 39 (2014), 509-527. Terence Denman, ”Hibernia officina militum’: Irish recruitment to the British regular army, 1660-1815′, Irish Sword, vol. 20 (1996), 148-166.